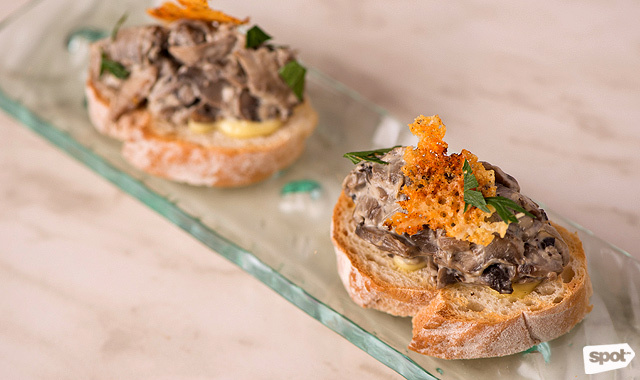 Don't expect the usual tapas from Chef Ariel Manuel. 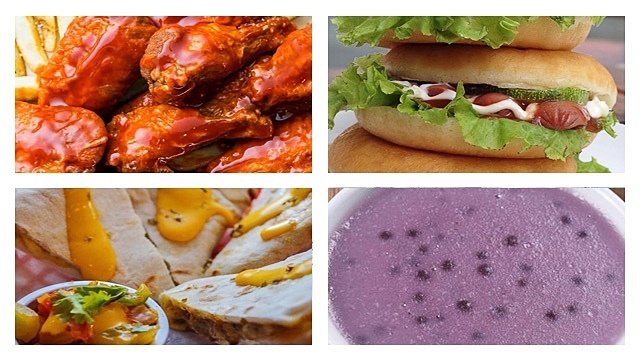 (SPOT.ph) You need to try the camaron. 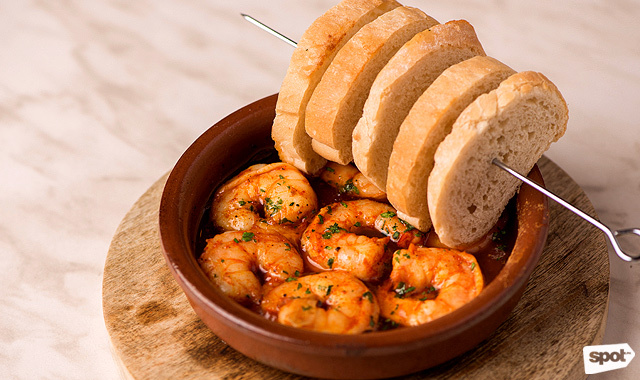 It is an unusual thing to say about a place that specializes in tapas, but, as Chef Ariel Manuel points out, he never set out to open a typical tapas restaurant. 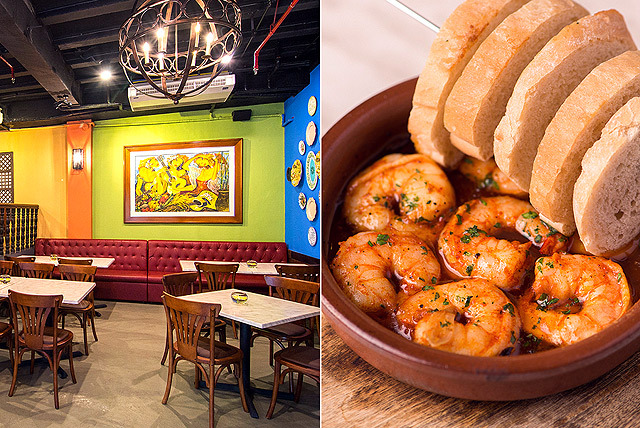 Instead, the chef shares, Taperia Poblacion is all about recalling a time in Manila when life went by at a much slower pace, and food was carefully prepared to merge the best things about two different cultures. 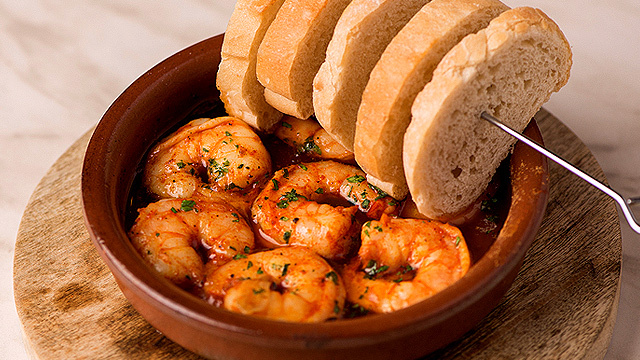 “It’s shallow Spanish,” Chef Ariel smilingly says, and while a quick glance at the menu might make you think otherwise, a taste of some of the most noteworthy dishes will tell you exactly what he means. 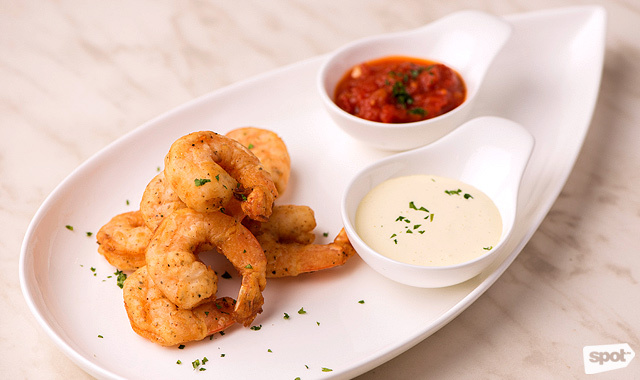 The aforementioned Olive-oil Fried Shrimp Camarones (P480), for example, recalls the humble panciteria menu staple—but take one bite and you’ll get an explosion of peppery flavor hugging succulently plump shrimp that the chef imports from Indonesia. 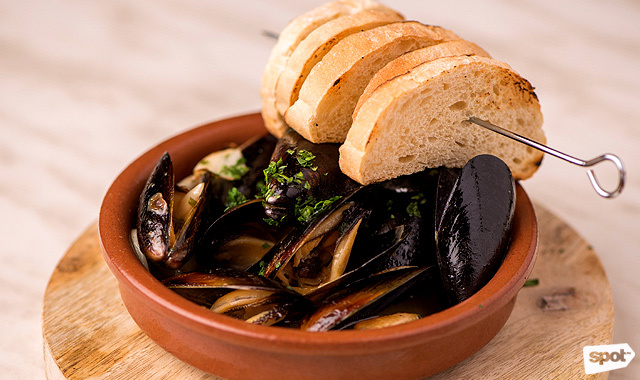 Have them with the Chilean Mussels a la Mariniere (P360), the garlic and white wine providing an understated backdrop to shellfish that boast an addictive smokiness. 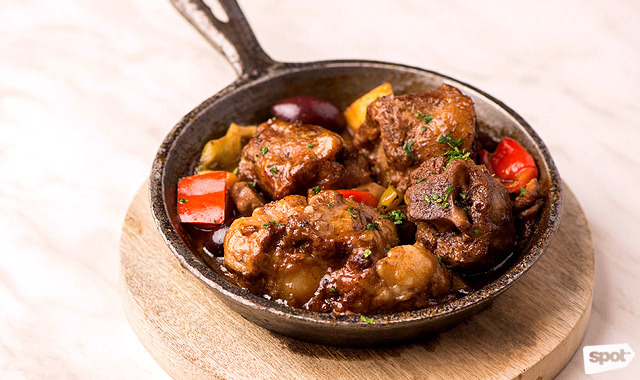 For something more substantial, try the U.S. Ribeye Salpicao (P495), the tender beef punctuated with the slightest touch of acidity and spice from tomatoes and mustard. 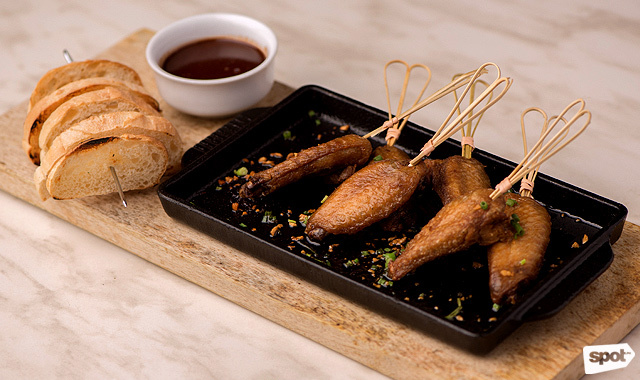 There’s also the Chicken Wing Adobo with Chocolate Sauce (P320): the wings are perfectly crispy and need no embellishment, really, but the chocolate sauce—tantalizingly sweet and savory all at once—adds playful dimension. 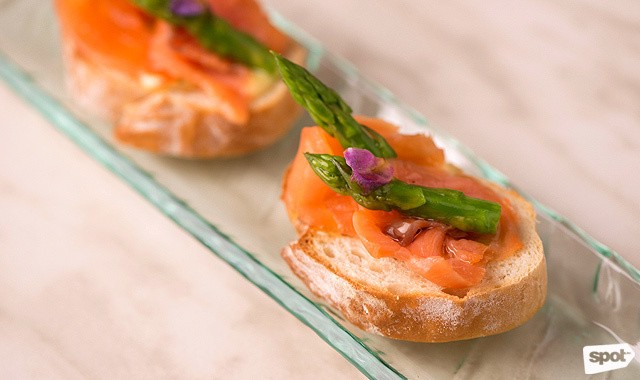 If you’re more a pintxos kind of person, the Smoked Salmon and Asparagus (P85/piece) is a briny, creamy indulgence, and the Mushroom with Cabrales Cheese (P70/piece) balances sharp and earthy flavors to perfection. 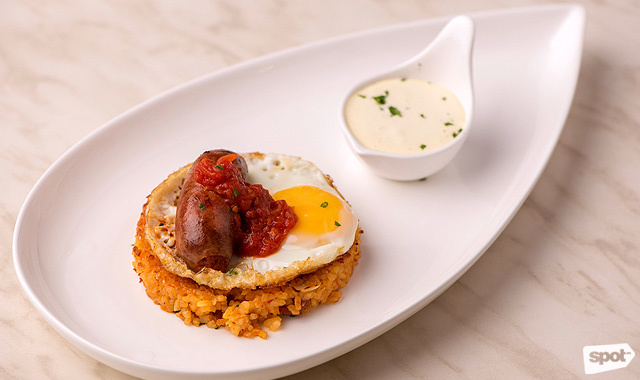 Everything looks almost like art, each element placed delicately on top of the other so you almost feel terrible about taking a bite—or taking a slice, as is the case with the Chorizo Arrozada with Fried Egg (P230), which features Spanish rice infused with saffron. 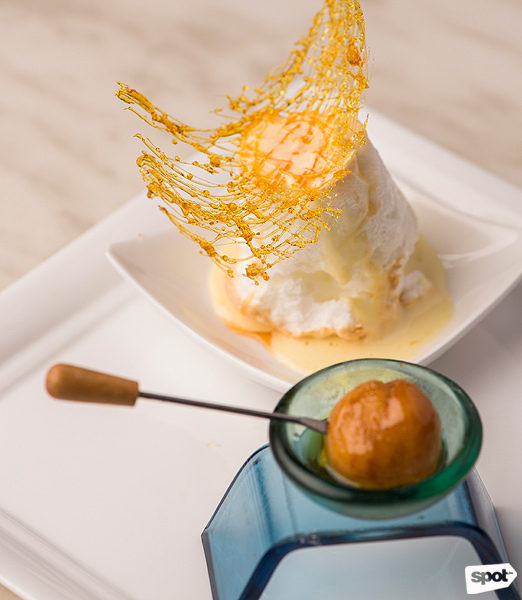 If reading about all these Spanish-inspired delicacies is starting to make you hungry, trust us, when you’re actually there, you’ll be equally pleased to discover Chef Manuel’s other venture in the same building, The Sippery. Like Taperia, The Sippery has a homey, lived-in feel, brimming with character. After walking through its doors, the first thing you’ll notice is a wall stacked nearly floor-to-ceiling with bottles of fine wine—a good sign of what to expect. 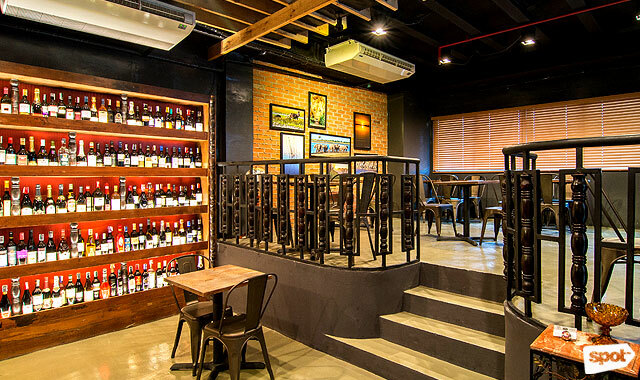 The chef envisions The Sippery as a place where people can enjoy excellent wine, Cognac, single malt Scotch, sake, tequila, and a few craft beers in a casual, unpretentious environment. While the drink list is extensive, don’t expect to find cocktails here. “We’ll leave that to the other bars,” smiles the chef. But true to form, Chef Ariel didn’t pass up the chance to whip up a few signature wine-based concoctions to complement his tapas. While a basic sangria is on the menu, he puts his own spin on the Queimada, a traditional punch from the Galicia region of Spain, by adding lots of local citrus to the red wine base. The citrus tempers the Pinay Queimada’s other flavors, which come primarily from the addition of candied coffee. Even before you have a sip, you’ll know it’s there, thanks to the robust coffee aroma. Needless to say, both coffee and wine lovers should give this a try. For something less intense, the Mangria is deliciously fruity and refreshing. As you might have guessed, this sangria is made with a mix of red and white wine with bits of dried mango and mango juice. We’re torn between this and the Cava sangria, which is made with Spanish sparkling wine, red wine, lemon and lime juice, with some brandy. 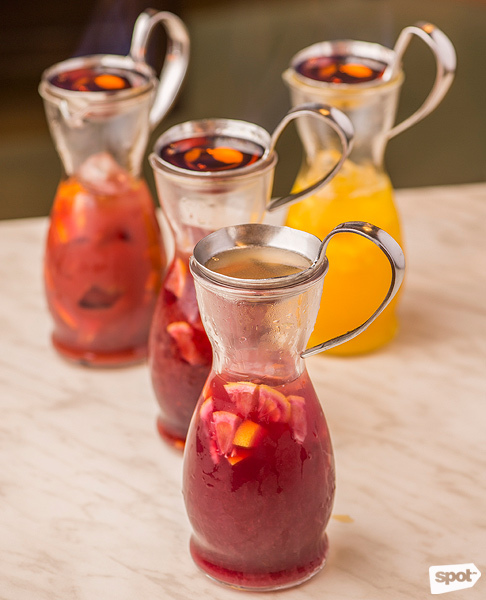 All of Chef Manuel’s sangrias are served with some tableside drama: Before each drink’s liqueurs are poured into their respective pitchers, they are set aflame on repurposed soup ladles. According to the chef, this allows the excess alcohol to burn off while leaving the liqueur’s important flavor profiles behind. So remember: Pour it quickly into the drink if you want more alcohol! The Sippery's drinks can be ordered from Taperia, but chances are, before you even look at the menu, your attention will be drawn to Taperia’s carving station and the Pugon Lechon of Pork Belly (P485/portion). 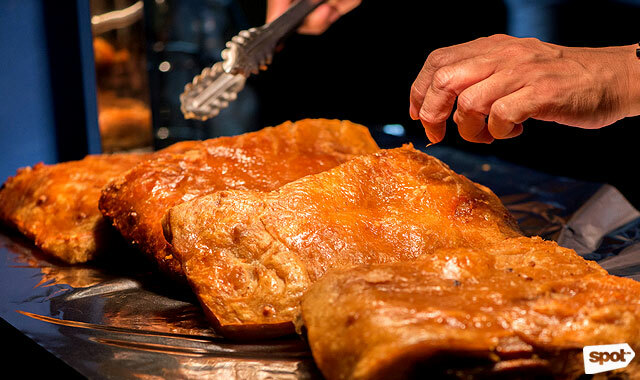 Chef Ariel leaves it in his charcoal brick oven for four-and-a-half hours, making the skin irresistibly golden and crackly with every bite. 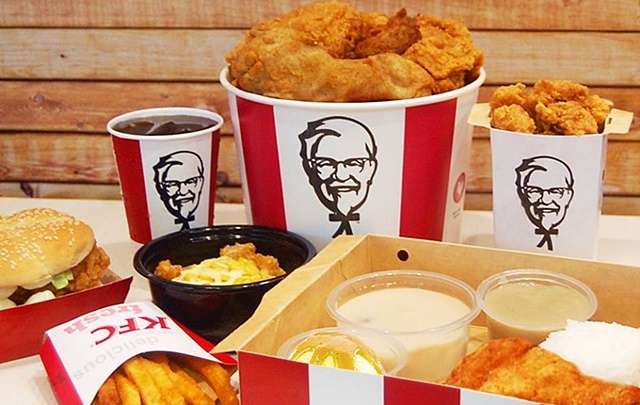 Want something slightly less sinful? 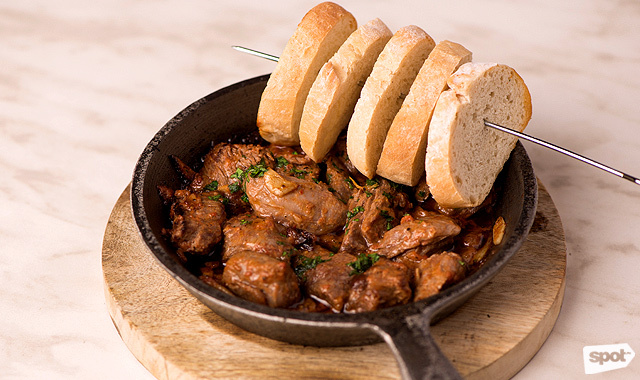 The Oxtail Kaldereta (P470) is packed with flavor and braised till tender. 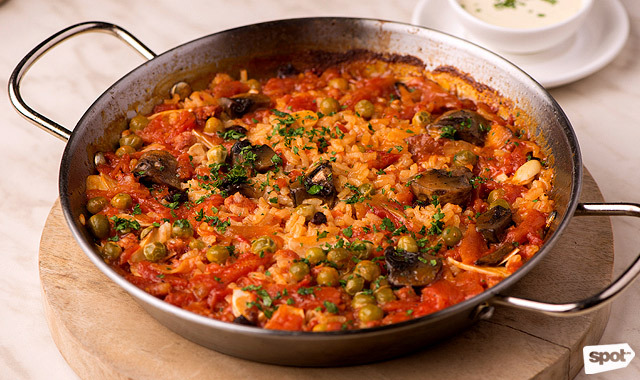 Either would go well with the Arroz Valenciana (P660). 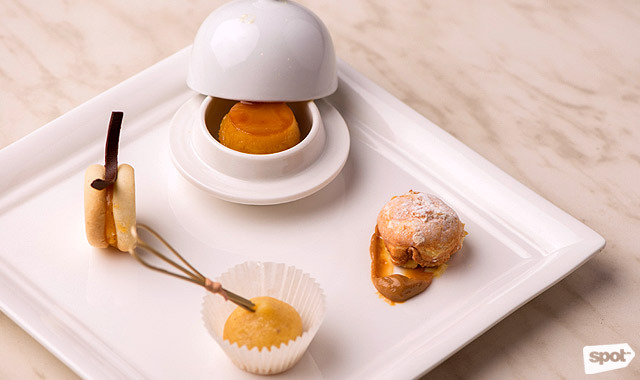 The sweets selection includes classics like tocino del cielo and alfajores, but for the Dessert Sampler (P195/three), we’d go back for the brazo de mercedes with its caramel kick, the canonigo topped with a graceful arc of candied sugar, and the yema, punctuated with a delicious crunch and a subtle orange zest, plus the faintest whisper of heat. But really, try the camaron. 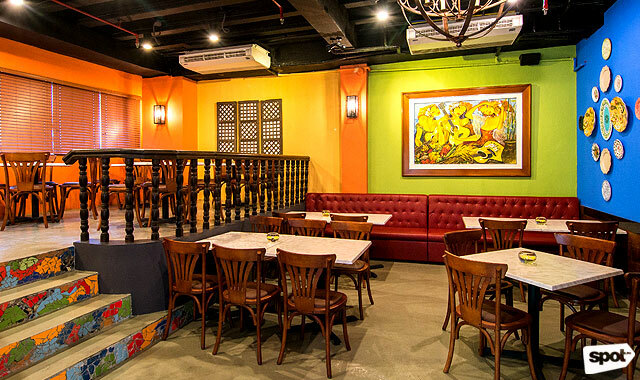 Perhaps it stands out because it almost seems symbolic of what makes Taperia Poblacion remarkable: a philosophy also evident even in the interiors, which has elements taken from the beloved former Lolo Dad’s. 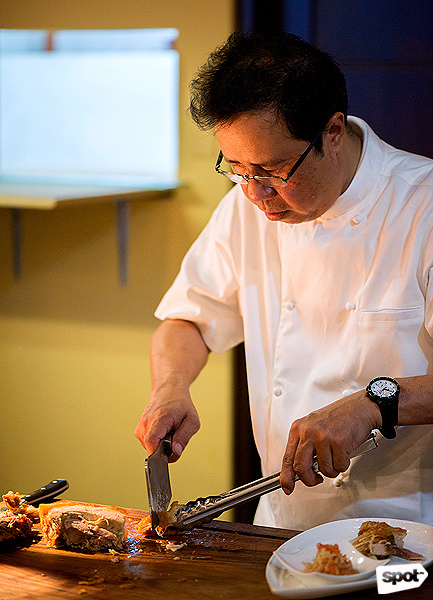 It’s an extraordinary taste of Chef Ariel’s perfect balance between the traditional and familiar, and the intrepid and personal.